You must make reservations at least 5 minutes in advance of the time at Havabite Eatery. We have a wide range of catering items. Just give us a call to discus catering your next event! Since 1978, we are a family owned and operated restaurant serving Greek, Italian and American favorites. We strive to make you feel welcomed, full and satisfied. Come enjoy a Greek beer or an Italian wine with our daily specials offering hearty portions of our classic family restaurants. A popular Greek dish made with roasted potatoes, eggplant, ground beef and topped with béchamel sauce. Shrimp sautéed with garlic, white wine, feta and fresh tomatoes. Served on a bed of rice. A blend of fresh spinach and feta cheese wrapped in a delicate fillo dough. Baked to perfection, our lasagna is prepared with three cheeses and loaded with ground beef. Grilled marinated pork tenderloin with onions, green peppers and tomatoes. 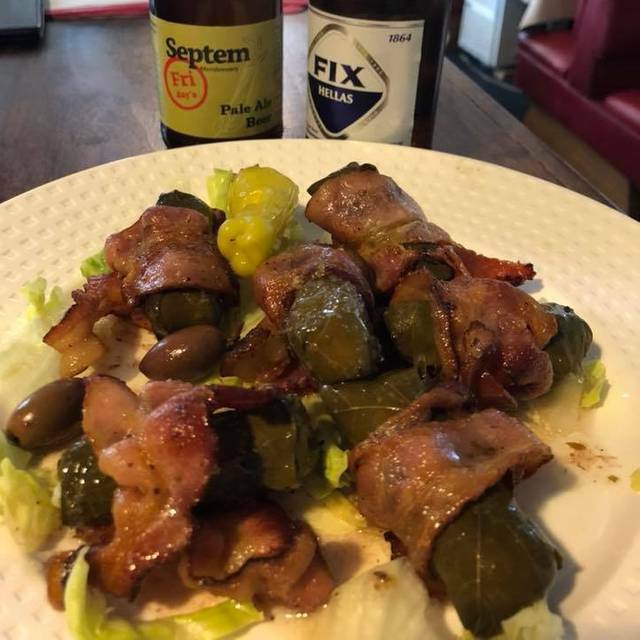 Served on a bed of rice and topped with feta cheese. Grilled marinated chicken breast with onions, green peppers and tomatoes. Served on a bed of rice. Fresh Chicken Breast prepared in house. Served with a side of spaghetti. Served with our homemade Alfredo Sauce. Spaghetti in a homemade Alfredo Sauce tossed with sautéed bacon, onions and ham. Sprinkled with Parmesan. Spaghetti smothered in a rich homemade marinara sauce. Baked with mozzarella cheese and a rich homemade marinara sauce. Pepperoni, Italian Sausage, Ham, Bacon, Gyro Meat & Meat Balls. Olive Oil, Mozzarella, Feta, Garlic, Sliced Tomatoes, Pepperoncinis, Olives & Gyro Meat. Mushrooms, Green Peppers, Onions, Tomatoes, Olives & Pepperoncinis. With Fried Onions, Lettuce, Tomato, & Mayo. With Lettuce, Tomato, & Mayo. Sliced Ham, Turkey, and Pastrami. Topped with Provolone Cheese, Lettuce, Tomato and Mayonnaise. Served with house dressing. Green peppers, onions, mushrooms with mozzarella cheese and a homemade marinara sauce. Pepperoni, sausage, meatballs with Mozzarella cheese and a homemade marinara sauce. With Mushrooms, Swiss Cheese, Bacon. With Mushrooms, Fried Onions, Green Peppers, Provolone Cheese. Feta, Grape leaves, Taramosalada, Tzatziki Sauce, Hummus, Greek Olives, Tomatoes, Cucumbers, Pepperoncini, served with our delicious Pita Bread. With Cheese & Marinara Sauce (5 slices). (Free Refills), Coca-Cola, Diet Coke, Sprite, Orange Fanta, Classic Zero. Selection of Greek and Domestic beers. Prices vary. Selection of Greek and Domestic wines. Glass, Half-Carafe, or Bottle. Prices Vary. very nice food, bit pricey if did not choose a special. lovely staff and charming setting, "old fashioned". bathroom needs to be updated. would, however, go again. Four of us went there for a late dinner. The food was great, the service was friendly. We will definitely keep returning. Wonderful evening with fabulous service and food! Cannot wait to go back! Nice mom and pop place. Food was good, kids loved the chicken soup and my son raved about the pizza. Adorable, cozy country kitchen type restaurant. The food was delicious. It tastes like a hone cooked meal! The restaurant is very small and the booths are very tight and stiff-backed. I understand there is a patio and I would only return to sit outside or at least in the warm weather. Every time the door opened it was freezing - the restaurant is small and arriving guests tend to stand in the doorway because there is no where to go. The booths were not comfortable but the food was good. I first went to Havabite back in 2006 and have loved it ever since. The true and genuine Greek atmosphere and food is fantastic. Not only is the food really good, the service is what you would expect from a Greek family restaurant. I took my family here for my brides birthday and the owner basically babysat our 2 year old the whole time. Sat her up at the bar and helped her color, she made her chocolate milk, and entertained her the whole meal. I just love this place and will continue to go back so long as I’m in Northern Virginia. We ate here for my birthday lunch and the food was fabulous. We had the spanakopita meal with Greek salad and broccoli, and the special, which was half a chicken served with salad and sides. Their tzaziki is so good. 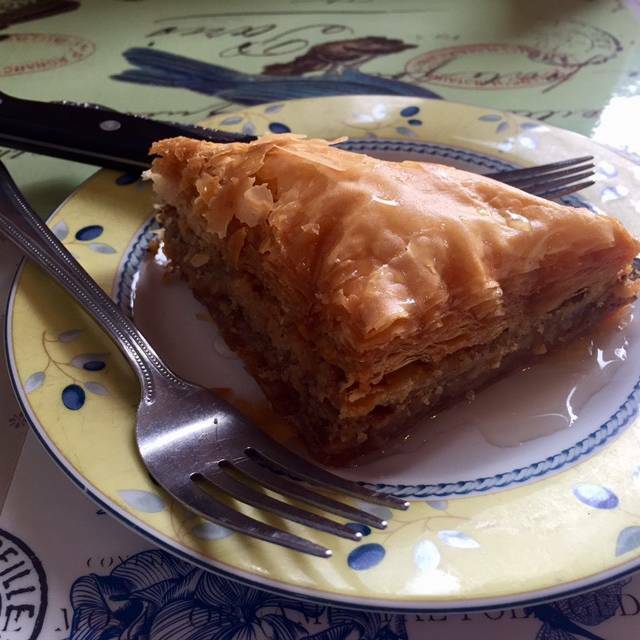 We also had the best baklava and coffee for dessert. The place is quaint and has character. Make a reservation if you plan to go at a busy time. I will definitely be back. Quaint place in the heart of Fairfax City. Very pleasant staff and food was very good. A group of 9 of us met at Havabite Eatery for an early Sunday dinner. We really enjoyed ourselves there. Ida and Alex were absolutely wonderful. The food was fresh and fantastic and the service was top notch. The menu is extensive and a good value. Charming place. We'll be back! What a hidden gem. The reason it is 5 Star is because it is such a cosy, warm feel, welcoming place with great food. It is like going to your grandma s house. Ida, the owner, is so open and remembers all the details of your previous visit. The servers, Daniel and Alex are the best. The Greek salad is my favorite. It is not a fancy place but it is wonderful. Very nice experience. Food is great, service is friendly and quick. Recommend this place! The food was outstanding and the servers were both very friendly. My only issue was that we were not close to being finished with our appetizer or salads when our dinner was served. We appreciate quick service, but we also appreciate service that doesn't make us feel rushed. We were looking for a gyro place and haveabite came up in the search, so we tried it. such a cute little place and the staff knew we were first timers. They were so nice suggesting menu items and wine choices. We will definitely return. Awesome neighborhood gem. It has a mom-n-pop feel, very casual, but the food is consistently outstanding and varied. Can get pizza, traditional Greek fare, burgers, salads. Everything is terrific. I had one of the specials and husband had the chicken kabob. The service was appreciative and attentive. Really a great local place.